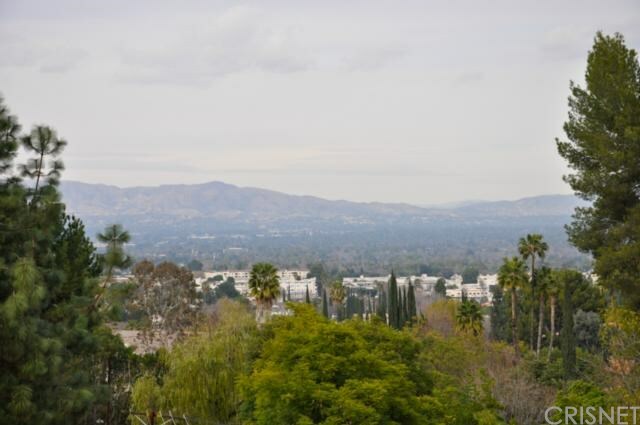 A tree-lined driveway leads to this Encino Hills hideaway with a magical setting and beautiful views of the valley! The Cliff May inspired single story mid-century home has pitched beamed ceilings and sliding glass doors in practically every room creating a seamless flow between the indoors and outdoors. The living room has a slate fireplace and the adjacent family room is spacious with a wood stove and skylights. The kitchen has walnut cabinets, built-in appliances, a dining area with fireplace, a breakfast bar and built-in desk. Two of the three bedrooms are en-suite and the master suite has a walk-in closet as well as a second closet. There is also a laundry room, and workshop. The grounds have built-in benches, mature trees including several fruit varieties, and paver stone decking. First time on the market in over 50 years and lovingly maintained by the current owners, it is ready for new owners to either remodel, update, expand or also could be an excellent development opportunity to build a dream estate.